Dad has been absent quite a long time in your son’s life given that he is 14 months old. In this situation it really is best managed by expectations. Your son will not remember his father in the way you or Dad are expecting and is highly unlikely to react the way you would love. So it’s best to lower your and Dad’s expectations. It is likely that your son will not want to give Dad for a big cuddle and be touched by him. He will follow your example and if your husband actually stands back and lets his son do the approaching in the first few hours of being home then he will quickly climb onto dad’s lap and play. Often when absent parents or grandparents come to visit they are so keen for a cuddle and a chat that it is too overwhelming for the child and it pushes them further away. A pediatrician once taught me that even eye contact makes a big difference. With young children, avoiding eye contact for the first five minutes or so actually makes them feel more comfortable. Then after five minutes start including them in the eye contact and they are much more relaxed by this stage and won’t be hiding behind Mum. Try not to expect too much or take his reluctance of Dad to heart and see it as a personal wound. Give it time and it will happen. Bonding happens when we are together and it is enjoyable. Try to involve Dad in the basic care for your son i.e. Bath time; nappy changes as it is through these experiences that they will bond. This can sometimes be difficult as by now you are used to doing it all on your own and will automatically respond to your sons needs. If you expect that they need to bond all over again then this will help ease the pressure on your son. 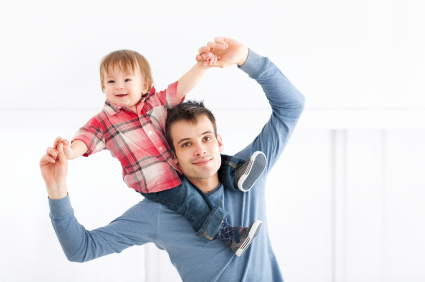 Given that your son is now 14 months, when Dad next returns your son will remember him and have memories to build on. You can help this process by talking about Dad and the photos as you have previously done. A couple of other suggestions are, make a photo book from this visit of you all and the things you do and print it out for your son and regularly look through this. Also, while Dad is at home this Christmas, get him to make a tape or audio of him reading your sons favorites book or purchase a Hallmark recordable book, therefore, your son can play this each night and have Dad read to him as he falls asleep. Therefore next time dad is home it will not be so hard.